Two hours is hardly enough time to cover the complex and highly prolific artistic life of American Jazz musician Sun Ra but I have tried to put together a 101 introductory radio show for those who might not know much about this other worldly man or which releases to start with among his epic catalog of music. From 7pm to 9pm tonight we will explore the 4 phases of his life: his early years growing up in Alabama, his Chicago stint where the Arkestra was born, his communal living / practicing in NYC, and then onto Philadelphia where he finished out the rest of his days. Its fascinating to me to think about those who were born into the start of the last century and lived through much of it to experience all incredible technological advances the world saw during that time period. Musicians during these decades saw equally remarkable steps forward; like being able to record music no less mass produce it so the public in turn could listen to it in the privacy of their own homes. Musical instruments were constantly being updated, including the birth of amplification (Amps! Condenser mics! ), the invention of electric guitar / basses, and synthesizers, and effect pedals (to name just a few inventions); not to mention the progression of musical styles. (Ragtime to swing to bebop to hard bop to free jazz and so on). Sun Ra lived through nearly a century of wild growth and he was among the leaders in the Jazz and the African American community that kept growing and endlessly experimenting under no one's terms but his own. FUN FACTS ! ! ! *He was doing it himself within the music industry (owned a record label / self released music) before DIY was even a thing. *While this didn't exactly make him more reputable as a musician, he is among one of the first Americans on record to talk about being abducted by aliens; ahead of the American obsession with E.Ts by a good 15 years. *Sun Ra gave birth to afrofuturism that groups like Parliament, Funkedelic, Hendrix, and Herbie Hancock rooted their careers in. *Sun Ra didn't agree with the Free Jazz tag to some of his music (especially live) but he is still considered a founding father in improvised freeform Jazz, albeit it very well practiced and structured improvisation. 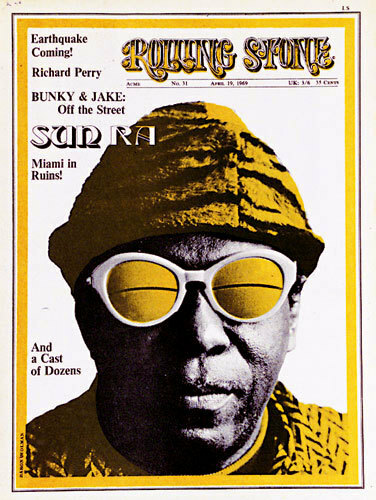 I stumbled across a terrific BBC documentary on Sun Ra (seriously, the BBC make the best documentaries!) and found it to be a tremendous starting place as I delved into his personal history and immense discography for the first time. You will just have to tune into WRIR tonight to hear his life story told via music. Missed the show? Download it here!